The under 19 Sri Lanka poolist and the gloveman of Mahanama College Colombo Pawan Ratnayake notched up his second century in the ongoing cricket season when he scored a splendid 106 runs against formidable Moratu Vidyalaya in their inter school first eleven cricket match worked off at Irrigation Ground Ratmalana. 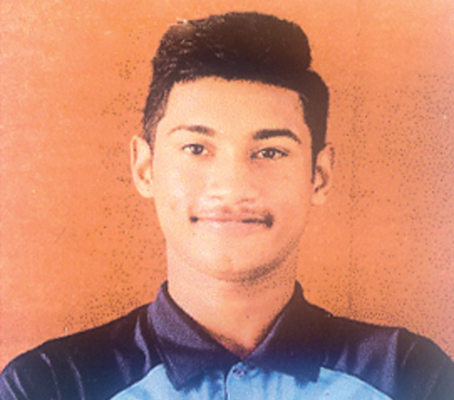 His innings enabled Mahanama College to gain a first innings win by 109 runs. Pawan’s innings was studded with six hits to the ropes and five over and occupied the crease for 287 minutes and faced 174 balls. Moratu Vidyalaya – 190 in 65.2 overs – Nishan Madushka 90, Hashan Adithya 22, Rashan Kavishka 23, Awantha dulakshana 20, Pathum Boteju 2/28, Danuka Nimmana 2/9, Sonal Gamage 4/71. Mahanama College – 299/6 in 93 overs – (Pawan Ratnayake 106, Shonal Gamage 78 n/o, Vimika Rubasinghe 57, Bishan Mendis 38, Eran Hansamal 4/108).